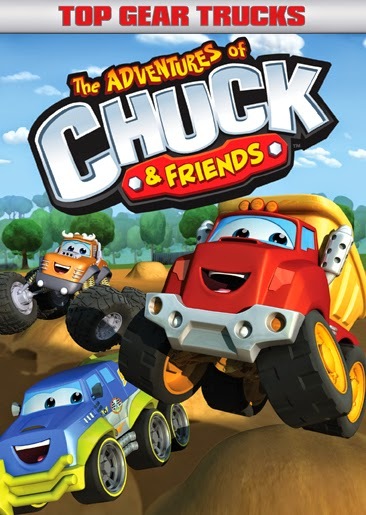 That adventurous and fun-loving Chuck and his best friends Digger, Handy, Rowdy, Biggs, Boomer and Flip continue with more exciting free-wheelin’ epic escapades! Watch as Chuck and the friends discover adventures trying to uncover the identity of a mysterious “ghost,” getting as muddy and messy as they can, re-creating the night Chuck’s parents first met and more in these ten awesome cartoons guaranteed to put fun into high gear! I'm sure as all moms know little boys LOVE adventures. I'm sure little girls do too :). Chuck and friends provide just that! My little guys are always getting into the action and cheering Chuck on :). My little guys have a bunch of the Chuck and friends cars and whenever we watch they insist we bring them out so we can do w/e they are doing on TV. Chuck is not only fun for the kids, but as a mom I like that its a good decent show that I don't have to worry about them watching. Top Gear Trucks DVD is the perfect addition to The Chuck and Friends Adventures. You can see the pre-purchase link here.